Simply Good Works strives to support our Local Community as well as some National Non-Profit Organizations. We do our best to promote charitable services, acts of kindness and thoughtful sacrifices made in support of our Good Works initiative. We are currently working on our Annual Wounded Warrior Benefit Concert, to be held in August of 2017. Last year we raised a significant amount of $$$, thanks to the members of the Loyal Order of the Moose, Lodge#2049, The American Legion, Post#419, the Elk’s Lodge #522 & our incredible community of supporters, friends and family. We are proposing something different this year, something uniquely special! With the support of the Independence Fund, who provide Track Chairs, and Paws for Purple Hearts, who train & provide Service Dogs, we hope to raise enough $$$$ to provide our disabled Vets with the tools and support they need to lead normal, productive lives. Action Manufacturing, based in Marshall, Minn., has designed a chair with caterpillar tracks instead of wheels: a track chair. 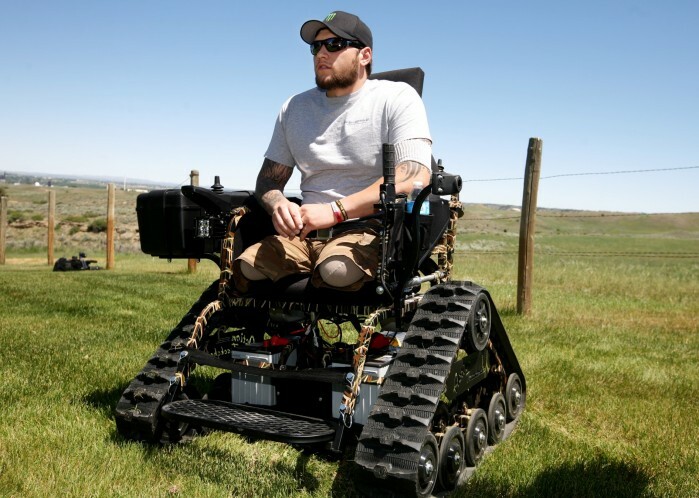 With the Action Trackchair, the manufacturer touts, “you’ll go places you didn’t think possible”, which includes the woods, the beach, in mud, on snow, etc. Our newest addition is Paws for Purple Hearts, which is the first of its kind to offer therapeutic intervention for Veterans and active-duty personnel by teaching puppies to become service dogs for their comrades with combat related disabilities at no cost to them. PPH is built upon the trusted and time-honored tradition of Veterans helping Veterans. This program is expanding throughout the United States. Paws for Purple Hearts is licensed by the Military Order of the Purple Heart and the Military Order of the Purple Heart Service Foundation, chartered by an act of Congress for Combat-wounded Veterans. We also wish to acknowledge the efforts of HomeFirst, an organization dedicated to helping the homeless Veterans in the Santa Clara Valley. The Team @ Simply Good Works will put all of its effort and resources in support of this lofty goal. We are confident that our good friends and corporate Sponsors will respond generously, as they have in the past. Please Save the Date………..September 15th! – An Early Bird table for 8 can be reserved for $400.00.